Let’s talk about what VulkanRT is (Vulkan Runtime Libraries) and if it is a good idea to uninstall from your PC. This application, as they say, is installed on their PCs without their permission. Thus, the users have a double state of mind about this application being a spyware of some sorts which can cause problems to the computers. Thus, we are going to tell you about What is Vulkan Runtime Libraries, is it a malware application and should you worry about it being present on your computer? Vulkan Runtime Libraries is basically the graphics drivers which are installed automatically as we update graphics drivers on our computers. It is a 3D graphics and compute API by Khronos Group which is a part of the Vulkan. Note that this application is automatically installed on the PC whenever the graphics or video drivers are updated. Now, it’s installation is done by display card manufacturers such as NVIDIA, Intel or AMD present on our computers. While strolling through your PC, you might have come across the application program folder named VulkanRT. So, about the installation of this application being a malware or virus that can infect your PC, be assured that there is no need to worry about installation of Vulkan Runtime Libraries on your PC as it is completely safe. The installation is done to enhance the graphics processing capabilities of your computer. If you are wondering about its practical usage and its importance on your computers, note that the Vulkan Runtime Libraries or VulkanRT works to lower the overhead in terms of performance and gives users direct control over the GPU. Also, it helps in lowering the CPU usage on the computers during heavy performance-inducing tasks so that the performance cores don’t max out which could result in shut-down of the computer. Now, some of you might also be thinking that it is a useless application and you might want to uninstall this ‘redundant’ file from your PC but you should not uninstall it as we have already discussed its importance. Now, this package is included with the Nvidia drivers so you might not notice about how and where the installation took place. Basically, the VulkanRT is needed for playing graphic-intensive games and other things which include graphics cards such as Video Editing. Talking more about it, termed as a 3D Graphics API whereas Vulkan is a graphics standard similar to OpenGL or DirectX. VulkanRT is present on our PC for gaming and the main purpose of it is to enhance 3D performance in Gaming. How to Locate VulkanRT Program on Your Computer? Check for the Application Inside Settings Application. Open Control Panel on your PC. Click on Uninstall a Program option which will be under the Programs and Features section. Search for ‘Vulkan Runtime Libraries’. If you get the output, it means that the application is installed on your PC. You can also check the installation on your computer running Windows 10 by simply going to the Settings application (Windows + x). 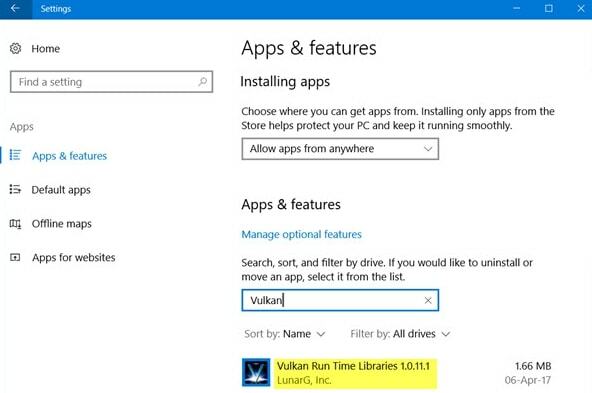 First of all, click on Apps and Features inside Windows 10 Setting application and search for the ‘Vulkan Runtime Libraries’ in the list of installed applications as follows. Now, many of you might have a question that what will happen if you uninstall it. Keep in mind that you will not notice about the uninstallation of this application from your PC as it is not a core file needed for the functioning of Windows. However, take note that you may notice the uninstallation of Vulkan Runtime Libraries while playing Games as it is needed for 3D performance in Gaming. For example, some of the games like Dota 2, Talos Principle, Star Citizen, CryEngine, and Unity along with Steam games require Vulkan RT so if you are playing any of these games then it is not recommended to uninstall this application for your benefit. How to Re-install Vulkan Runtime Libraries after Uninstalling? If you are one of those users who would have assumed that Vulkan Runtime Libraries is a malware and uninstalled the program, later realizing the importance of it. It is worth noting that the re-installation of Vulkan Runtime Libraries once uninstalled is not straight-forward as it is not available separately. In case you want to install it again, you will have to re-install the graphics drivers on your computer which will install the Vulkan Runtime Libraries on your PC once again. VulkanRT helpful in reducing the CPU power consumption through the process of batching which is helpful in keeping the CPU free for other processes or idle otherwise. It provides a Unified management of computing kernels and graphics. Thus, eliminating the need for using a separate compute API along with the APIs for graphics. It is compatible with multiple modern operating systems such as Android, Linux, Tizen and Microsoft Windows similar to OpenGL. Vulkan API is more complex in terms of cross-platform graphics management as well as management compared to OpenGL. It is not universally supported and there are some applications which do not support Vulkan API which restricts graphics performance in some applications on particular devices. Finally, we hope that you would have known everything about this application which is the sole purpose of this article. Also, we will reiterate that this application is not a malware and it is totally safe to keep it as it is on your computer. Notably, you cannot download Vulkan Runtime Libraries separately once uninstalled so you should keep in mind that some of the games on your computer might not run same as before after its removal. 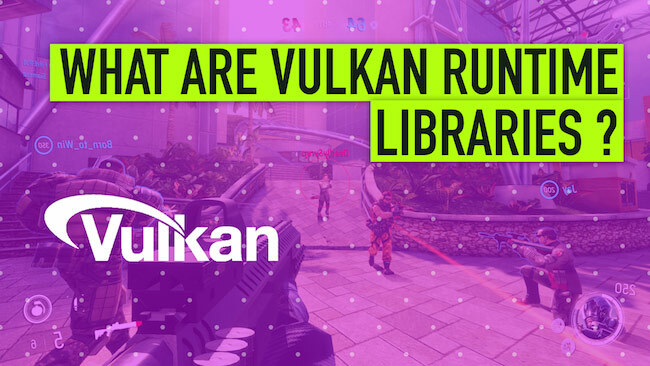 Apart from that, if you have any other concerns regarding any of the points mentioned above about the Vulkan Runtime Libraries then do not hesitate to comment in the comments section below. Abhishek Jariwala is a technology enthusiast from Surat, Gujarat. He has completed his Bachelor of Engineering in Information Technology. He loves to read books, watch cricket and can be found watching Formula 1. He loves to explore technology and is delighted with every new smartphone launch that takes place.